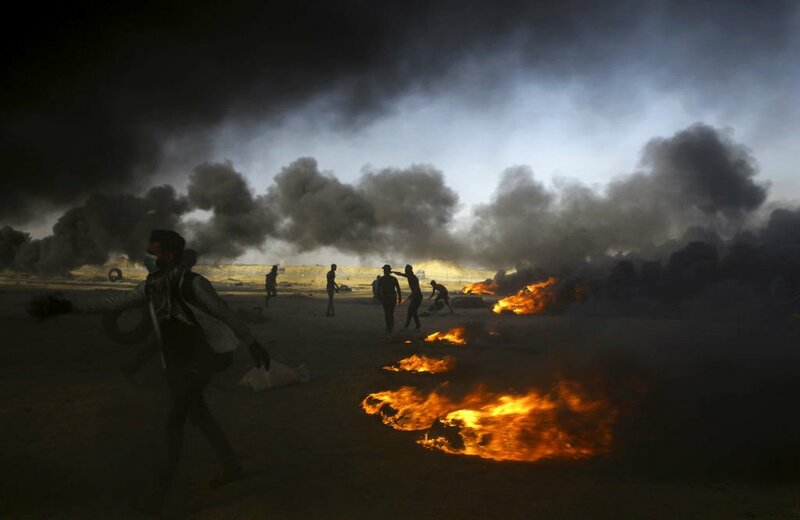 Palestinian protesters burn tires during a protest at the Gaza Strip's border with Israel, east of Khan Younis, on May 15, 2018. Israel has been accused of using excessive force after Israeli troops firing from across a border fence killed dozens of Palestinians and wounded more than 2,700 at a mass protest in Gaza. Zak Ebrahim delivering a recent talk. Zak Ebrahim addressing an audience recently about his experiences growing up as the son of a terrorist and breaking free of his father's radical ideology. In the U.S., freshman Rep. Ilhan Omar has stirred debate about how to appropriately criticize Israel as well as Americans’ support of the Jewish state, even as Jewish-American organizations condemn a new alliance between Israel’s Likud Party, led by Prime Minister Benjamin Netanyahu, and the racist far-right Otzma Yehudit (Jewish Power) Party. Members of Otzma Yehudit proclaim themselves proud followers of the radical Rabbi Meir Kahane, whose ultra-nationalist Kach Party was banned from the Israeli Knesset (parliament) in 1988. Kahane, who founded the Jewish Defense League in 1971, later admitted to terrorist activities. He was assassinated at a New York City hotel in 1990. In Charleston, Zak Ebrahim, son of the man who killed Kahane, will talk on March 14 about that event and how it colored his life. Not long after, former Ambassador Daniel Shapiro, who was the Obama Administration’s liaison to Israel for eight years, will be in Charleston on March 28 to talk about developments in Israeli politics and the unusual and sometimes tumultuous relationship between Israel and the U.S. In anticipation of these events, The Post and Courier spoke with Ebrahim and Shapiro, as well as local Jewish leaders, about recent developments. Ebrahim is the author of “The Terrorist’s Son: A Story of Choice,” published in 2014 to coincide with a TED Talk delivered that same year. Sponsored by Chabad of Charleston and the Low Country, he will give a talk at 7 p.m. Thursday, March 14, at the Center for Jewish Life, 477 Mathis Ferry Road, Mount Pleasant. Ebrahim’s father is El Sayyid Nosair, who not only killed Kahane but plotted several foiled terrorist attacks in the U.S. and one, against the World Trade Center in 1993, that wasn’t stopped. Ebrahim, 35, said he had endured bullying as a child, an abusive stepfather, and the stings of poverty, which were experiences that helped him develop strong empathy for others suffering from injustice. This moral compass served as a counterweight to the ideology of his father and his cohort who attempted to indoctrinate Ebrahim in a form of religious and political extremism. Since 2010, when he delivered his first speech in Texas, Ebrahim has embraced every chance to share his story and foster conversation. “I don’t necessarily feel that I have to make up for my father’s actions, but I realize in some sense it is a privilege for me to have learned from his mistakes,” he said. During Ebrahim's earliest years, until about age 7, his father was kind and loving, he said. But then he became radicalized and increasingly stayed away from home. Ebrahim, coming of age in the dark shadow of his father’s violent and bigoted extremism, huddled at home and read books, watched TV, played video games. He was a shy, chubby kid and, because the family moved a lot, always the new face in the classroom, always the awkward student. But his world began to open up when he was college age. He joined a youth group focused on violence and abuse and met his first Jewish friend. Soon after, he got a job at an amusement park and met his first gay friends. His sense of self-worth improved. He began to reclaim the humanity his father and his stepfather had stripped from him. “I’m never quite satisfied with myself, I’m always trying to find ways to be a better person,” he said. For a while, Ebrahim visited his father in prison, and one day he told Nosair that he had abandoned Islam. As the months passed, Ebrahim slowly traded his disappointment for relief. Kahane has been back in the news recently. The Kach Party he founded in 1971 advocated for expulsion of the Arabs from Greater Israel; annexation of the West Bank, Gaza and Golan Heights; a ban on intermarriage; Jewish control of the Temple Mount and more. The governments of Israel, the U.S., Canada, the European Union and Japan called the party, and the fringe Kahanist movement in general, “racist” and a terrorist group. Last month, Netanyahu forged an alliance with the Kahanist Otzma Yehudit party, which has advocated the use of violence against Arabs, in an effort to shore up a coalition in order to win re-election. The move outraged many observers, even right-leaning pro-Israel groups. The move comes at a time in Israel when the left is weak and few are advocating strongly for a two-state solution, he said. A two-state solution is becoming more difficult to achieve with each passing year because of settlement expansion and other “facts on the ground” and because of security concerns, he said. “We need strong political leadership ... to revive the two-state solution as a desirable and achievable goal,” he said. Shapiro refuses to give up all hope, citing other sudden political turnarounds, such as the 1979 peace treaty between Israel and Egypt after years of acrimony and violence. It doesn’t help matters that Netanyahu has flip-flopped on the issue, initially rejecting a two-state solution, then offering tepid support, then rejecting it again. “Preserving the status quo is his modus operandi,” Shapiro said. Joshua Shanes, associate director of Jewish Studies at the College of Charleston, said he is concerned about those who oppose the Kahanists but fail to repudiate those who have been fanning the flames of extremism. On Wednesday, the Central Elections Committee voted to disqualify one of two main Arab-Israeli parties, Ra’am-Balad, from running in the upcoming elections. It also banned Ofer Kasif, a left-wing Jewish member of the other Arab-Israeli party, Hadash-Ta’al, according to The Times of Israel. Rabbi Moshe Davis, of Charleston’s Orthodox Brith Sholom Beth Israel synagogue, said several extremist parties, on both sides, have found their way into the Knesset over the years. It’s noteworthy, he said, that the influential American Israel Public Affairs Committee (AIPAC) has condemned the effort to mainstream Otzma Yehudit. Davis said he didn’t think political leaders would soon seek to resolve the Israeli-Palestinian issue with any urgency. He said Netanyahu is afraid that the political parties to his right are a threat and that folding in Otzma Yehudit helps to neutralize their influence. He said these latest developments have reintroduced Kahane into political discourse after decades of official condemnation, and this signals a potentially dangerous shift: the mainstreaming of racism and radicalism espoused by a segment of Israeli society that has been mostly on the margins. WHERE: College of Charleston’s Stern Center Ballroom, 71 George St.